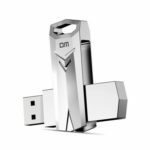 This DM PD096 Flash Drive features USB 3.0 high-speed interface, can transfer files in a flash, saving time and improving work efficiency. 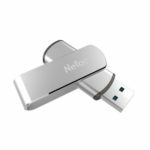 USB pen drive with 360 degree rotation metal shell, the capless design can avoid loss of cap, and provide efficient protection to the USB port. Compact and lightweight, designed with hanging hole, easy and safe to take important files on-the-go. 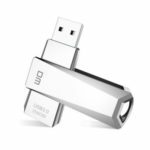 Up to 5Gbps transmission speed, can transfer files in a flash. Enabling super speed data transfer 40-90 MB/s reading speed, 15-30 MB/s writing speed, ultra stable and high speed transmission. Plug and play, no extra driver needed, convenient and easy to use. Crafted with premium alloy, waterproof and shockproof, attractive in outward and durable in usage. Small size and lightweight, with hanging hanging buckle, easily fits in your backpack and pocket, let you easily store important files and take it on-the-go.